Occidentalism » Blog Archive » But the Real Question: Can it Reach Dokdo? But the Real Question: Can it Reach Dokdo? SEOUL, South Korea South Korea has developed a longer-range cruise missile that can hit targets deep in North Korea and beyond, a newspaper reported Tuesday, a month after reports said the country had developed its first cruise missile. The new missile has a range of 1,000 kilometers (621 miles), which could reach all of North Korea and some parts of China, Japan and Russia, the newspaper Munhwa Ilbo reported, citing unidentified government officials. Under a South Korea-U.S. missile agreement signed in 2001, South Korea can only develop missiles with a range of less than 300 kilometers (200 miles) and a payload under 500 kilograms (1,100 pounds). But there is an exception in the case of cruise missiles. South Korea can develop a cruise missile with no range restriction as long as its payload is under 500 kilograms (1,100 pounds). I’m glad to see that even though the talk coming from South Korea in regards to North Korea isn’t of the caliber one would expect based on the situation, the actions being taken are more showing of the true thoughts on the government’s mind. When they make moves like this that show they clearly are concerned about their safety, it makes it obvious all the talk of ‘loving brother Kim^2’ wasn’t meant to fool anyone but Kim^2 himself. But I imagine this type of saying one thing and doing completely the opposite can’t look good on one’s resume, however in this case it’s better then doing nothing. In Addition: This image from the original article shows the range in something that is easier for us to grasp then numbers. This is a report by IHT. I’m not so convinced that the recent SK arms buildup is trully aimed at NK. Their recent arsenal build-up seems to be more geared against Japan and beyond. I remember that SK purchased F-15s to “defend Dokdo”- the usual game. I was sort of relieved that they seem to have received lemons or don’t possess the capability to maitain such sophisticated hardware. It seems as if an Asian arms race has been started by the Kimchi Axis. Let us hope that the brave American soldiers are not in harms way if the bellicose Koreans start a war. Let us also hope that the great civilization of Japan is not harmed either. Your perception of Korea’s new missile defense capacity lacks context. And Japan has done all of this while not being under threat by any foreign power. All of these actions during peacetime indicate that Japan is a potential threat to peace in Northeast Asia. If Korea acquires a more robust missile defense system, then Korea is acting in a strategic manner to defend stability in Northeast Asia. Gee, you Korean ultranationalists are really paranoid. Why don’t you calm down and learn about post-war Japan for once in while? And it’s really peacetime now, eh? With N Korea firing missiles overhead and threatening to test nuclear bombs? The US is not cooperating with SK with advanced defences because the S Koreans are not technologically capable and her intentions are very much doubtful. Also, it seems that China is stepping forward in NK sanctions. In essence, SK is becoming politically isolated. Some “balancer”, alright. Gee, you Korean ultranationalists are really paranoid. Why don’t you calm down and learn about post-war Japan for once in while? The list I provided in my previous post all pertained to post-war Japan. Indeed, all of the actions I specified have taken place within the last 10 years. And it’s really peacetime now, eh? With N Korea firing missiles overhead and threatening to test nuclear bombs? North Korea is not at war with Japan, Tomato. The US is not cooperating with SK with advanced defences because the S Koreans are not technologically capable and her intentions are very much doubtful. Tomato, it is essential that you learn how to fashion a logical argument. My claim was that Japan’s proposed missile system is more advanced than Korea’s current missile system. Nothing you’ve said above challenges my claim. Also, it seems that China is stepping forward in NK sanctions. In essence, SK is becoming politically isolated. 1. Ceasing food and fertilizer aid to the North. 3. Cutbacks on student subsidies for Mt. Geumgang visits. 4. Implementing a temporary cease and Kaesong expansion plans. And this is the target of criticism. In particular, frankly I think it is stupid to cut food aid but still and continue mt GEumgang visit. YoungRocco, did you even read my post before you just started calling my name out? I’m glad to see that even though the talk coming from South Korea in regards to North Korea isn’t of the caliber one would expect based on the situation, the actions being taken are more showing of the true thoughts on the government’s mind. When they make moves like this that show they clearly are concerned about their safety, it makes it obvious all the talk of ‘loving brother Kim^2′ wasn’t meant to fool anyone but Kim^2 himself. But I imagine this type of saying one thing and doing completely the opposite can’t look good on one’s resume, however in this case it’s better then doing nothing. which has absolutely nothing to do with what you’re talking about at all. Furthermore, be aware that I am still on the lookout for you and your favorite past time of hijacking threads. Anything off topic will be removed immediately. Just a warning. Posts on topic, and you have nothing to worry about. Both North Korea and Japan can easily defend against cruise missiles. The biggest point of this whole thing as I interpreted from the broadcast on SBS news last night was that South Korea thinks it brings them into an elite club of nations who have cruise missiles. It’s all about the ch’emyon. The cruise missile is for attack. Not for defense. It is for nuclear power generation. Not for weapon. Japan accepts an inspection of IAEA. Four ships are placed on duty, and fifth and sixth ship are constructing now. These destroyers have anti-craft and anti-ship and anti-submarine missile. Have not ground-attack weapon. This ship is impossible to attack other countries. In the first place, Aegis system is for fleet defense. Not for attack. Do you understand Missile Defense System? I do not think that you understand Missile Defense System. There is a right of self-defense in Japan. A Patriot missile is a weapon to strike down the missile which flew coming in Japan. This missile is impossible to attack other countries. What? Do not you know? North and South Korea sometimes did a skirmish. A Chinese nuclear submarine did territorial waters violation. Japan has made it very clear that it is considering acquiring the capability to “pre-emptively” strike the Korean peninsula. A Japanese enemy is China and North-Korea. Not South-Korea. Is South-Korea force the armed forces to follow North-Korea? I am always surprised to see those ethnocentric and higly emotional statements made by many educated Koreans when it comes to Japan. Judging by the excellent command of English, YoungRocco must be a well educated person who must have experienced some overseas life. Yet he becomes like the Hinomaru-burning mob when he discusses on the Japanese matter. It is as if the term “Japan” triggers some particular neuron to ignite which in turn induces “火病”. Japanese invading the neighboring countries again? They have too much to lose by now to do such a thing. They just want Koreans to leave them alone. It is essential that you free yourself from Chosun/Han-guk Mansei ideologies and come out to the real world where Korea only gets what it deserves. I wouldn’t ever defend the Korean tendency to affective wackiness and illogic in decision making, but of course it’s telling that the radius of the new cruise missiles can effectively encompass Beijing. Yes of course, Noh is going to continue to talk smack about Japan and the US. A good friend of mine still on the peninsula calls them “grave-pissers”, i.e. they’d only pick a fight with someone who can’t or won’t fight back. Notice their deference for Kim Jeong-Il and Hu Jing-Tao. Their illogical and anachronistic hatred of Japan nevertheless does allow for an arms buildup no matter who might be threatening them. But they’re not that smart. They have an ideological need for the appearance of independence. Wow, Tokyo is in bigger letters than others and definitely within the red circle. Sorry, not bigger but in bold is what I meant. I have nothing to worry about regardless. Furthermore, be aware that I am still on the lookout for you and your favorite past time of hijacking threads. Their[Koreans] illogical and anachronistic hatred of Japan nevertheless does allow for an arms buildup no matter who might be threatening them. The Koreans, north and south cannot be trusted. Though, I suppose the above post could also be considered race-baiting. Have a nice day. I am glad to bring joy in your life. Darin, stop lying. All of the above are rude, and you let them slide. You are not deleting my posts because they are rude. If you were deleting posts for rudeness, you would delete all or even most rude postings and not just mine. Darin, if you have a policy against Koreans, that’s fine so long as you declare it. If you have a policy against people who disagree with you, that’s fine, so long as you declare it. If you have a policy against people who are rude and disagree with you, while letting rudeness from those who do agree with you slide, that’s okay too, so long as you declare it. But don’t take the cowardly route of lying. By the way, on the subject of lying, it is you doing that. At first you insisted that sarcasm was sincere, but when you were called on it, and could not refrain from it for ‘a valued friend’, your lie was exposed. So look, either get with the program, or just get banned. Oh, and if your next comment is something about being censored, you will be banned. Sorry, but I have everyone to think about here, not just YoungRocco. On any other site you would be banned already, without anyone even giving you a warning. I think Occidentalism is one of the most tolerant sites on the net. Clicking on the link for the word lying will direct you to what I am talking about. Stop playing ignorant, final warning. Ya know what, actually, I just read the last part of your comment here agian..
And I’ve had enough. You’ve had more then your fair share of warnings, you stolen more then your fair share of threads by propagating your agenda of, well, what is your agenda anyways? Prohibiting discussion? You’re done, end of discussion. GarlicBreath should watch his mouth. You are being very racist: “kimchi axis”&”bellicose Koreans” vs “great great civilization of Japan”. What is racist about calling japan a great great civilization? I also like Germany and France? If I say France has a great great civilization am I being racist? Koreans are being belicose. have you not read the news papers? North Korea promises to turn the sea of japan and seoul into a sea of fire.This is bellicose. What about when South Korea promises to send naval battle ships after japanese peaceful unarmed survay vessels. Lastly the kimchi axis refers to the north south alliance against the USA and Japan. Kimchi is a popular food in South Korea whose origin is Japan. The Kimchi axis is very militant. kojibomb, did you hear about this? A korean hero to be sure. Very shamful that South Koreans support a spy like him. I dont think Japan has similar kind of people. no but you see… you can’t just refer to Korea as ‘kimchi’ some people find it offensive… Its obvious to see your hatred toward korean people. I didn’t care about great Japan; just comparing kimchi and great. hope you understand. You said I was racist because I hate korea and like japan. Are korean and Japanese people a different race? Korean people are very proud to notify anyone the Korean ‘blood’ in japan. I like Korean very much, and japan too. I dont agree that to refer to Koera as kimchi is offensive anymore then calling Koreans dog eaters is offensive. Kimchi and dog eating is part of Korean culture, and I dont see any need to appologise for Korean culture. I never said you hate Korea or like Japan. Its obvious to see your hatred toward korean people. I didn’t care about great Japan; just comparing kimchi and great. I think you did say that I hate korea and like japan (think its great). I have never heard that calling korea kimchi is done often and is racist. I think you are making this up. I did not know about this, but why bring it up, is it becasue you want to bring japan down? Down to the level of eating dogs? No you got it all wrong… sorry…. well…. just don’t call Koreans kimchi…. Why don’t you use the word “Koreans” but “kimchi”? It just confuses people so don’t use it please. oh… You didn’t know about eating whales… I thought everybody knew… if you found that offensive, I apologize…. I m not bringing Japan down by saying that though… I have 2 culture Japanese and Korean, and I just said I hate those cultures. Let’s just get over this. I m not trying to be racist here. oh… but I find it funny that you know bad side of Korea but not Japan. Why is that? I wasn’t going to get involved.. but…. So you’re contradicting yourself their big time. You didn’t say anything about whales, you said ‘dolphine’. As far as I know, 1) ‘dolphine’ isn’t a word, 2) people don’t eat dolphin in Japan 3) people in Japan do eat whale 4) just as they do in Korea. If you’re against whaling, that’s your prerogative, but you should keep in mind that Japan is not the only nation that hunts whale. Again, I think you’re confused both in what you want to say, and on some English words. You may want to start over again from the beginning and restate your thoughts for clarity. First you said dolphin now whale. Yes I know about japanese and Koreans eating whales. “Kimchi axis” refers to the North and South Koreans who are anti-japan and Anti-USA. I think it is very suitable. People clearly see when I say kimchi axis that I mean north and south Korea. If you are offended then I suggest eating a handful of midol. They do in Korea lol I didn’t know that. Yea… I screwed up there. I know its only whales but I just typed without checking anything so… I m leaving comments here playing studying for midterm so sorry..
oh… kimchi axis meant that… sorry.. i guess you can call anti Japan and anti USA people that. Ummm….. That’s not exactly a problem free ‘make it all better’ statement. You may want to check that. Down to the level of eating dogs? I sense a little contradiction here. Also, I don’t think I need to point out that name-calling by a characteristic of a group of people can and will be offensive for some people. The “You can only be offended if you let yourself be offended” argument doesn’t give you the right to go about and fire away with “potentially offensive” actions and words … at least not in a place where you expect any fair discussion to take place. Sorry, I realize I’m not a moderator here but I thought I needed to point that out. I learned my lesson. I m never going to talk about that again. Do say whatever you guys want. I ll just shup up and get on with my life. When I said down to the level of eating dogs, I was responding to Koji- post about eating dog is ‘gay’. Is talking about Korean dog eating offensive to you too? Koreans are very proud of eating dogs. Whoops, I missed that connection, as well as your intent for using the name ‘kimchi’. I thought that the atmosphere of 2ch was leaking out to here. But I also see labeling of people as Korean almost on reflex if they disagree with you at all on these issues, so my opinion on a place for fair discussions still stands for that. Is talking about Korean dog eating offensive to you too? I’m Japanese, and I’m actually interested in trying both dog and whale. I’ve heard people talk about how it tastes, but that made me all the more curious, if you know what I mean. And now that I’ve said that, angry mobs with torches and pitchforks from Greenpeace and PETA are probably going to come knocking down my door any moment now. … oh seems like someone’s at the door. I wonder who’d visit this late…. comment number 35 by: Occidentalism » Is it wrong to eat dog? Ignoring the idiotic replies here…. I always thought the CMs were for attacking China, not Japan. Reason: It’s easy to take over Japan once an army gets across…. so one needs a strong navy to think of attacking Japan in the first place. I think the map is drawn in wrong scale. I’ve lived in Korea for quite a long time (for being korean…) and the distance of 300km is not that long. 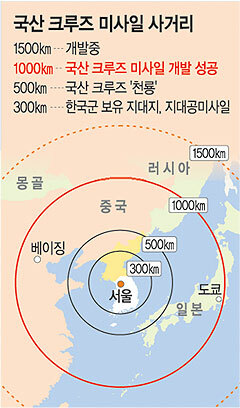 300km radius? No, no… 300 km is as long enough to drive seoul to end of east side of korea.